In part 1, the basic HA model uses ASG to recover Gateway instance when one fails. However, gateway service is unavailable in the affected zone during instance recovery. The length of downtime depends on how long it takes to build gateway from AMI, install and configure all software and services. In an enhanced HA model, availability gap during recovery is closed by dynamically updating route table to use Gateway in another zone. When a Gateway instance fails, ASG terminates old instance and builds a new one. The basic concept for enhanced HA is to detect a recovery event in Zone A, change route table to use Gateway in Zone B during recovery, and switch back to use Gateway in own zone once recovery completes. Note the selection of triggering events. Lambda failover is triggered by instance termination, which indicates ASG starting the process of rebuilding gateway. It is necessary to restore route table to use gateway in own zone, in order to load balance outbound traffic across gateways. The Lambda restore function updates route table as soon as recovery completes (as indicated by the attachment of ENI). When applying HA model to build Squid transparent mode Gateway for internet access, using a test instance to perform continuous HTTP access tests, enhanced HA method shows dramatically decreased down time (from 15 minutes to almost unnoticeable). As observed in route table, when gateway in zone A fails, default route in Zone A’s private route table is updated to use Gateway in Zone B. As soon as gateway is rebuilt in Zone A, its private route table is updated to use Zone A’s gateway again. In this model, load balancing and dynamic failover are achieved with event driven intelligent response and full automation. 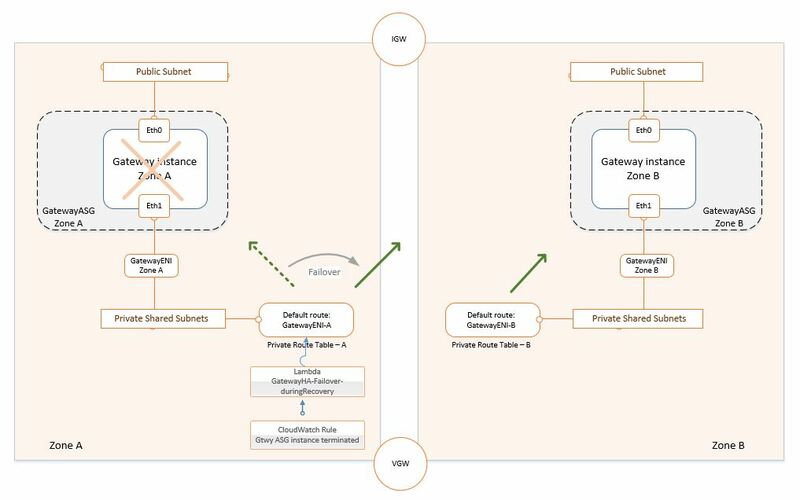 Gateway is used in AWS VPC to control egress traffic. In addition to NAT gateway, more feature rich gateway such as Gateway Transparent mode provides more sophisticated controls. Depends on a continuous running shell script to monitor availability and perform failover. If the process were to be terminated then no failover would occur. The design and implementation of basic HA model is covered here. See part 2 for enhanced HA. In cloud architecture, all instances should be behind an auto scaling group for resiliency. Here we leverage ASG to monitor gateway instance health. Auto Scaling health checks use the results of the EC2 status checks to determine the health status of an instance. Auto Scaling marks an instance as unhealthy if its instance status is any value other than running or its system status is impaired. Therefore gateway is monitored based on AWS health monitoring for auto scaling instances. Customization is also supported. In this non-proxy design, internet access via default route, which is defined in a private route table per AZ. In a HA scenario, instances may get replaced, so the routing table entry will either 1) remain "persistent" outside the instance, or 2) updated to point to the new instance. For the first option, what could be a persistent target for default route to point to? ELB would be an option, but it is not supported as a routing target. ENI is a network interface that can be detached and attached to instances so it can serve as the persistent target. Although there are some feature limitations and workarounds required, it is still proven to work. Another feature that comes with ASG is automated recovery of instances. However, there are some limitations to ASG, for example, it cannot set instance attributes and it cannot attach ENI. Those are implemented via instance bootstrapping. The diagram shows an architectural view of the new HA model. Gateway is placed in a single instance ASG, with two interfaces. 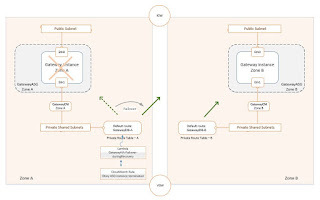 An ENI is attached to gateway instance, which provides persistence in route table even when a gateway instance fails (the ENI is reattached to a recovered instance). There is a limitation with this HA model, when a gateway instance fails, recovery time may take up to 10-15 minutes (to build a new gateway, install and configure the appliance). During the time gateway is being rebuilt for that zone, traffic is black holed in the route table before ENI can be attached to a new gateway instance. See part 2 for enhanced HA.